Our Wednesday Weekly got a new layout and we will also be able to send a regular monthly Newsletter soon. Please send your comments on the new layout, especially suggestions for improvements, to johannes.duschka@uni-leipzig.de. The award-winning movie Football Under Cover tells the story of the first female soccer match in the history of Iran - and our associated researcher Silke Gülker took part in this match. We will watch the movie on Monday, 13 March at 5 p.m. This day's Monday Coffee Break will be replaced by a shared dinner. On 9 March the exhibition "Bildwechsel. Buchillustration in der Reformationszeit (Changing Pictures. 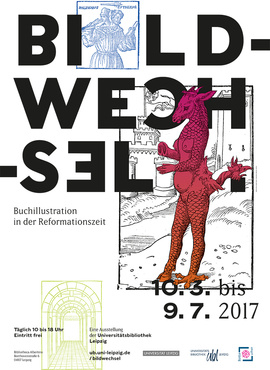 Book Illustration in the Reformation Period)“ will be opened at the Bibliotheca Albertina (Beethovenstraße 6). With Martin Luther's Reformation not only world views but also the ways how the world was illustrated changed. Books which were printed within that period show rich examples for this development. The "Changing Pictures" caused by the Reformation can be shown by book illustrations from the stock of the Leipzig University Library. Illustrations had various functions in the past, they were symbol, confession, satire, comment or mere decoration. Today they are witnesses of a great upheaval. The exhibition is open from 10 March to 9 July 2017, 10 a.m. – 06 p.m. Admission is free. Antje Dietze, Maren Möhring and Christiane Reinecke from Leipzig University call for papers on "What is holding societies together? Social cohesion and disintegration in historical perspective" for the ESSHC (European Social History Conference 2018) in Belfast. The deadline for proposals is 10 April 2017. Cologne University will host a Conference on "The Middle East as Middle Ground? Cultural Interaction in the ancient Middle East revisited" on 27 and 28 April 2017, which might be of interest for some of you. The conference aims at bringing together specialists from a variety of fields within Ancient Studies – Epigraphy, Archaeology, Ancient History, Religious Studies etc. – to discuss how various approaches describing cultural interaction could be brought together. Papers raise questions such as how local communities adapted to the change brought by the incorporation into larger units as the Hellenistic or Roman empires, how different cultural styles or forms were brought together to give new or old meaning or offer methodological studies on new ways of describing cultural interaction at a local, regional and supra-regional level.